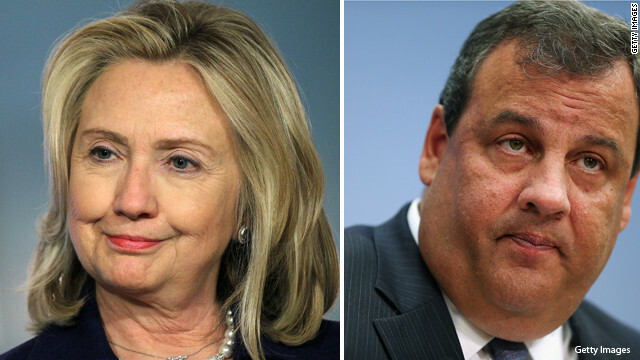 Washington (CNN) – Hillary Clinton is beating New Jersey Gov. Chris Christie on his own turf, a new poll finds. Fifty percent of New Jersey voters - who reelected Christie in 2013 - said they would vote for Clinton over Christie if the presidential election was held today, according to a Quinnipiac University Poll released Wednesday. Forty-two percent of voters said they would pick the New Jersey governor. Both Clinton and Christie are considered likely presidential candidates for their party and both are already making moves that hint at their presidential aspirations. Christie has raised funds across the country as head of the Republican Governor's Association, while Clinton is near the end of a two month long book tour. Neither, however, has said they are definitely running for the job. "As Gov. Christopher Christie traipses around the nation, his presidential potential seems alive, but former Secretary of State Hillary Clinton, the adopted girl next door, easily beats him in his home state," Maurice Carroll, assistant director of the Quinnipiac University Poll, wrote of the poll's findings. Clinton also outpaces three other Republican contenders in the Garden State: She beats former Florida Gov. Jeb Bush, 54%-34%, U.S. Sen. Rand Paul of Kentucky, 55%-35%, and former Arkansas Gov. Mike Huckabee, 57%-34%, according to the poll. One possible reason for Clinton coming out on top of the four other Republicans is her approval rating. According to the poll, 60% of New Jersey voters have a favorable view of Clinton compared to 38% who don't. That's better than Christie, who has a 47%-47% favorability split, according to the poll. That split was the good news for Christie. A majority of New Jersey voters (55%) told Quinnipiac that Christie would not be a good president; 39% said he would. Additionally, 49% of New Jersey voters said Christie should not run for president, while 46% said he should. The Quinnipiac telephone poll of 1,148 New Jersey voters was conducted from July 31-August 4. It has a margin of error of plus or minus 2.9 percent. No big surprise here. Unless something really crazy happends Clinton will end up being the potus. The ACA won`t affect her because she`ll run on making changes to it. However, if the split in the Democrat party continues between traditional Dems and progressives that could end up making a real problem for Clinton. You're right-on on Ms. Clinton and the ACA- plus she actually spearheaded the last run up to healthcare reform that inspired the GOP's response (that is essentially the current ACA). As to the Democratic party? Whatever "split" that is there is nothing compared to where the GOP is. Everyone will get on board with Ms. Clinton or whomever. The alternative is simply unthinkable.The GOP is still spinning out-of-control to the Right- it is simply going to be a matter of seeing who wins being more crazy unelectable than the other- the remnant neocons or the TEA Party.